The Flemish magazine Orgelkunst occupies a unique place in the sphere of Flemish publications. It is also the oldest existing organ magazine within the history of the organ in Flanders. It continues in the tradition of the Flemish organ periodicals (De Schalmei 1946-1950; De Praestant 1951-1972; Orgelkunst (1978)). The end of World War II saw the establishment of four major magazines: De Schalmei (1946 - 1950) In Flanders, the first organ magazine was founded in 1946 with the publication of The Schalmei. This publication was essentially a one-man operation by Berten De Keyzer, discontinued just following its five-year anniversary in 1950. The publication of De Praestant in 1951 was an almost seamless continuation by Flor Peeters, together with Titus Timmerman O.Praem, encouraged by the Organ Congress in the Tongerlo Abbey. Along with textual contributions, the organ’s creative powers were also expressed through an addition of a musical supplement. The last issue of De Praestant was published in 1972, more than two decades after its launch. A new team started in 1973 with the release of Luister van het orgel I by the Acta Organologica Flandriae. It was a single publication, albeit beautifully printed, due to the economic impact of the oil crisis at the time, leading to doubts about the viability of a new Flemish organ magazine. The same editorial board from 1973, now expanded in 1978, stood at the birthplace of Orgelkunst, a magazine that was conceived in the heart of the Vlaamse Vereniging ter Bevordering van de Orgelkunst v.z.w. (V.V.B.O.) (“Flemish association for promoting the organ tradition”) consisting of the founding members: Kamiel D'Hooghe, honorary director of the Royal Conservatory of Brussels, Agnes Dumon, Antoon Fauconnier, former heritage consultant for organs in the service Monumenten en Landschappen van de Vlaamse Regering (“Monuments and sites of the Flemish government”), Dr. Bernard Huys, former head of the music department of the Royal Library Albert I, Ghislain Potvlieghe, organ and keyboard instrument builder, and Patrick Roose of the newly established Vlaams Instituut voor Onroerend Erfgoed (“Institute for Flemish heritage”). Later (1984) Luk Bastiaens, organ professor at the College of Arts & Sciences in Leuven and Erasmus University College in Brussels, as well as Wenceslaus and Mertens (1996), historian and expert in organ design, joined both the editorial board and the organization. 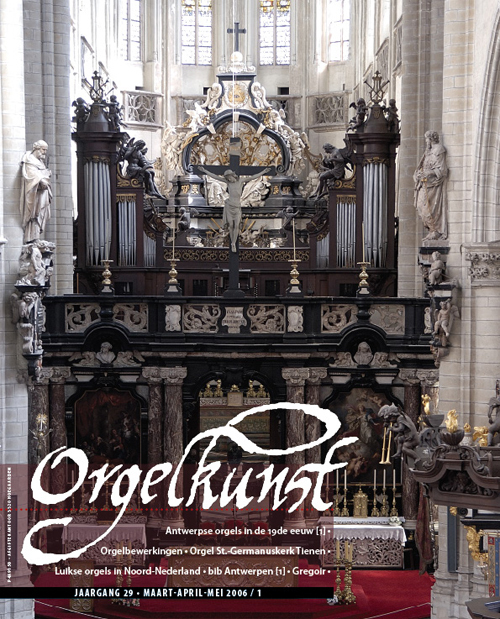 The new magazine arose from the intense drive of fellow organ enthusiasts for the ideas concerning the organ and organ culture within Flanders, with the study of the Flemish organ heritage serving as a foundation, alongside reviewing international trends and current events. A powerful organ movement was kindled and is still today being further developed and expanded through the intersection of the dynamic world of organ music with the study of historical organs and the technical craft of organ building. Conviction and growing insight contributed to a gradual embrace of the complete view of the highly differentiated organ world. In 2005 the “Vlaamse Vereniging ter bevordering van de Orgelkunst” v.z.w. was renamed "Orgelkunst" v.z.w. The torch has now been passed onto a younger generation in hopes of furthering the same drive and commitment to the happenings of the organ tradition in Flanders, and continuing to shine the spotlight both domestically and internationally on this most deserving legacy.